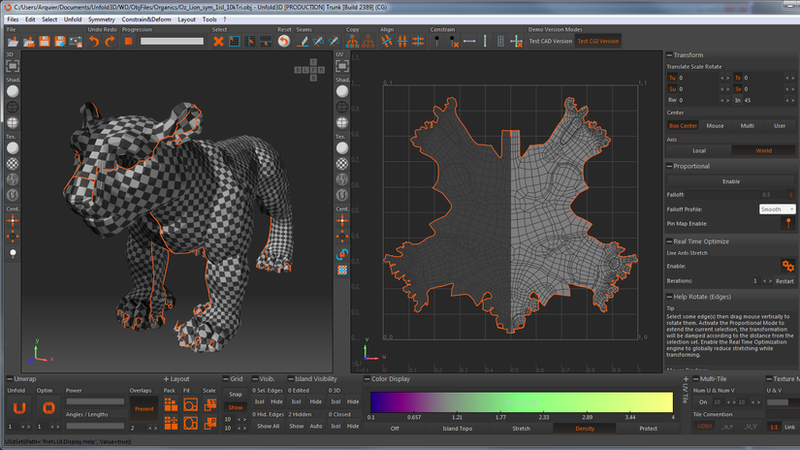 After one year and half of development the Polygonal Design release Unfold3D 9, software for unwrap of 3D model. New brush tool for Optimize and Unfold. Unfold does not create overlaps anymore when flattening islands. Possibility to add roomspace on the tight zones of the island frontiers to remove texture bleed. Full featured transformation panel (Rotate Scale Translate with mathematic evaluation). Different center and axis modes. New "Proportionnal Transform" tool (with distance mesh based). New Drag, Pinch, Spread brush tools. LUA script for a full control of Unfold3D. Free form area selection (raytraced). UDIM support with multiple UV Tiles. 5 new mouse presets: Cinema 4D, Blender, ZBrush, Modo, Rhino. New Grid with island bounding box and point snapping. New tools to hide, isolate, show islands. Automatic edge straightening tool for grid like islands.